Tomas is on vacation this week, he is having a break from the system. Our boiler is broken again, so it is pretty cold in the office and everyone is wearing long sleeves or jackets here. We are slowly switching to visual studio 2015, so we might use even more of the C++11 features soon. The 0.12.11 is out. It breaks most of the mods, as we had to change the interface to register events, but it was needed to fix one of the moddability pitfals related to saving and rendering the game at the same time. The changes needed to do should be trivial, so I hope the mods will be updated soon, sorry about the trouble. Rseding91 is quite productive, and he is coming with new ideas quite often. Thanks to him, our internal 0.13 branch (the next big release) already contains interface for scripts to register their own keyboard shortcuts, possibility to create new gui element types from script and much more. One of the things that I especially like is the blueprint book. 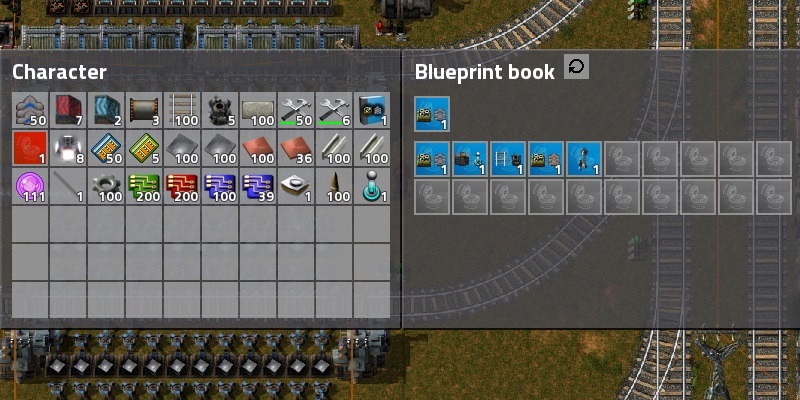 It can be used to store various blueprints, while one of them is active, so the whole book can be used directly as blueprint as well. It also allows the player to give it a unique name, so he can properly organize his blueprint collection. So not only we have custom trigonometric functions (as mentioned 72 friday facts ago), we will also have to have our custom printf methods. I made a stack overflow question covering this issue, so feel free to answer there. You can see the first work of Vaclav here. It will replace the the current smoke. It was one of the last Factorio graphics from the old days, when googling random pictures from the internet was good enough and cycled smoke was hard to find, so the animation had to slow down rapidly to last long enough. These problems will be no more. Let us know what you think on our forums.